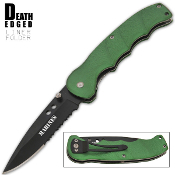 This knife features a razor sharp half serrated surgical steel blade that reads, "MARINES". The handle is made to grip with ease and prevent slipping when wet. It includes a thumb stud for easy opening and a belt/pocket clip for easy carry.